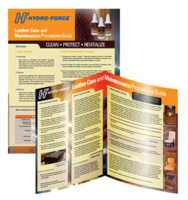 The Hydro-Force leather guide includes information on identifying various types of leather, perform a pre-inspection and then clean each type of leather. Protecting leather from future soils and stains plus revitalizing to keep leather feeling soft and supple are also included. Colorful illustrations, charts and helpful hints add to the technician�s confidence level when he puts the concepts to use. Download your free copy today below.